Those quintessential country fence-line perennial clumpers, Knifophias (Red Hot Pokers), have long been on my garden's 'Perhaps Not' list. Too coarse, too rudely orange perhaps? Well, well - I've finally seen the light. 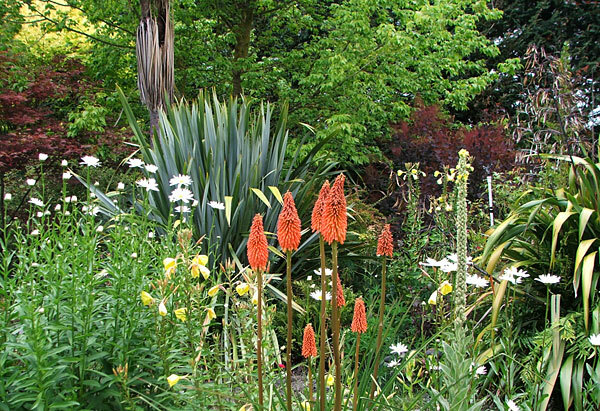 Remembering how bright and sunny the species looked when planted en masse, I decided to go coarse and country. 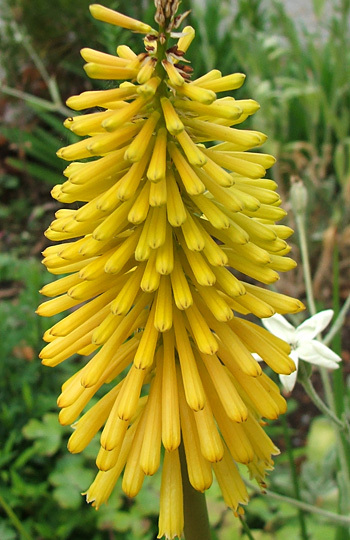 I bought a pot of Kniphofia which promised to be a proper 'Red Hot Poker'. No stylish subtlety, nothing miniature - this was the real blazing orange-red deal. Misunderstanding its need for sun, I moved it twice. It still barely flowered - just one floppy flower head, which the lawnmower managed to catch. Hopeless. Bargain bins at nursery sales can be tricky things, with large pots of no-name plants often on offer for a dollar or two. And I am, after all, the gardener who excitedly bought Red Currant bushes, thinking they were Philadelphus, and planted them in the shade of a shrubbery. So it was easy for me to mistake a pot of Knifophias for daylilies. I planted them innocently in the full sun by the water race. Hee hee. It was one of my happiest mistakes - the deep one-colour orange flowers appear in mid-summer, and they are absolutely gorgeous. And what's more - it's not hard to trim the old foliage in winter. What a stunning, rich colour! So now I've become a noisy fan of these reddest, hottest 'Pokers'. And I've branched out even more. Clumps of big, bright, golden Knifophias grow near my house along a country road-side ditch. A friend took a sneaky slice and gave me a piece. This summer it flowered for the first time. Please clump out for me - be as clumpy as you like. 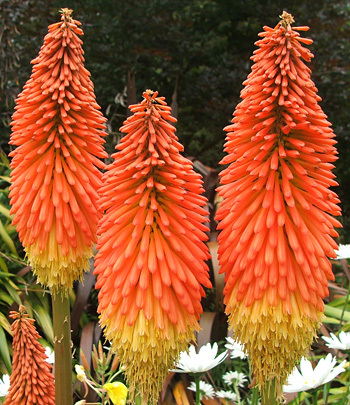 My Golden Hot Pokers are just as gorgeous as the Red ones.